Powell Feed and Milling has been manufacturing livestock feed in Green Forest, AR since 1942. We are a family-owned, customer-based company. With four feed mills and 13 retail locations, we pride ourselves in providing what our customers want, when they want it. The Powell family has been in production agriculture for three generations. This means we are in the same business as our customers. We strive to provide the best available products, offering the most return for our customers. Powell store managers are part of the local community, serving their friends and neighbors with confidence. We welcome the opportunity to help our customers with all of their agricultural needs. 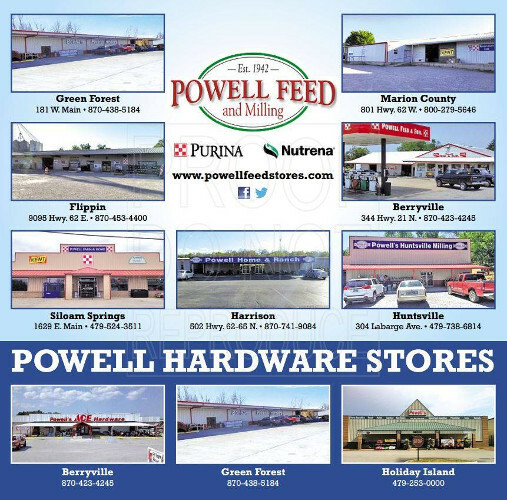 Powell Feed and Milling offers a full service farm store, providing everything from Livestock and pet feed to fencing and hardware. If we don't have what you need, we will do our best to get it!